'Tell Me More' Invites Listeners To Join #NPRAspen Dialogue On Opportunity In America : NPR Extra Is America still the land of opportunity? On July 1 and 2, Tell Me More is addressing this question with two live broadcasts from the 2013 Aspen Ideas Festival in Colorado and wants you to join the conversation in a live Twitter chat around education and opportunity in America. On July 1 and 2, Tell Me More is addressing this question with two live broadcasts from the 2013 Aspen Ideas Festival in Colorado and wants you to join the conversation in a live Twitter chat around education and opportunity in America. With roundtable discussions surrounding innovations in education, setting expectations for a "new type" of twenty-something, and the story of one young American college-grad who enrolled – disguised as a boy – in an Afghan school to better understand women's access to education, Tell Me More will set the stage for discussion and needs you to add your perspective. 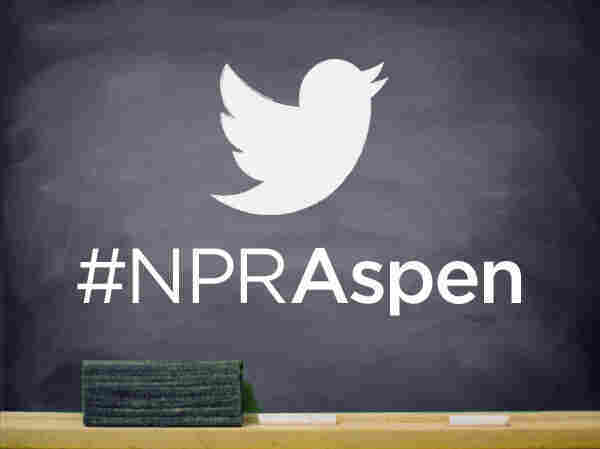 You can catch the show at its regular time: 11 a.m. - Noon (ET) / 9 - 10 a.m. (MT), and join the discussion on Twitter with @TellMeMoreNPR and #NPRAspen. Check out the complete guest list and topics, or listen to the archived audio here.